Warehouse is an architecture and art collective. Colectivo Warehouse is a Portuguese collective founded in the beginning of 2013 by two of the current four members – Ricardo Morais; Rúben Teodoro; Sebastião de Botton – and recently – Malin Mohr from Denmark. Since it was created, the collective had a total of 14 members, and countless external collaborators. In the private or public space the architectural practice of this group is based on a hands-on approach, enriching the creative design and the building experience. 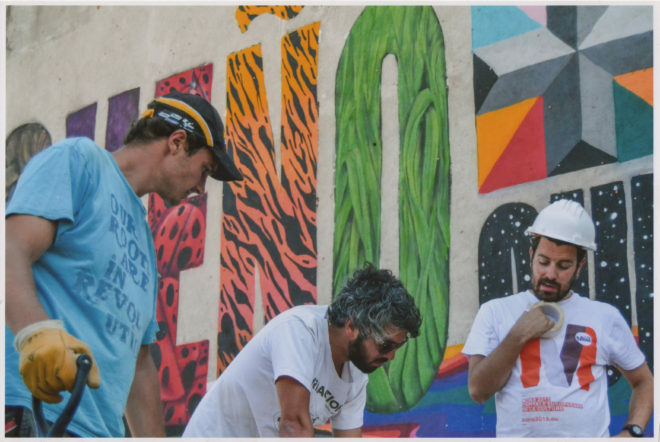 Since the beginning that the collective develop and take part in projects in a collaborative way, such as – “Casa do Vapor” (colaboration with exyzt); “Onde está a Graça”; “Mons Invisible” (colaboration with constructlab); “Biblioteca da Trafaria”; “FlagshipShelters Bottle Collectors Vip” (colaboration with KWY for SUPERFLEX)- among others. From the city scale to urban furniture warehouse also develop mediation processes towards participative architecture within social and cultural impact, highlighting projects like – “Cozinha Comunitária das Terras da Costa” (collaboration with ateliermob) winner of the award Archdaily BOTY 2016 – Public Architecture; “Sopa da Pedra” selected project in Locomotiva; “Bring a PAL” 1oprize in Building Trust International competiton. Currently the collective is developing projects between Portugal, Denmark and Russia, both in hands-on approach as in participatory processes.